June in Buffalo welcomes back the Buffalo Philharmonic Orchestra, who will close the 2017 festival with a full concert of works by faculty composers. The program includes David Dzubay’s Siren Song, Jeffrey Mumford’s verdant and shimmering air: four views of a reflected forest, and two works by June in Buffalo director David Felder, Incendio and Canzona. Canzona is a new work for brass ensemble receiving its world premiere on the festival—profiled in a past post in this publication. For much of its history, the orchestra has been renowned for its programming of new music. The orchestra’s first recording (1946) was the world premiere recording of the then-contemporary Symphony no. 7 by Dmitri Shostakovich, opened the door to later engagement with more radical works. Follwoing the appointment of Lukas Foss as music director in 1963, new music played a central role in the orchestra’s programming. Foss began by introducing early 20th-century repertoire such as Ives’s The Unanswered Question and Stravinsky’s Rite of Spring, and soon after programmed the most radical orchestral works of the post-WWII era, including the US premiere of Stockhausen’s Momente and works by Berio, Cage, Carter, Ligeti, Nono, Penderecki, Takahashi, Xenakis, and Foss himself, some of which were recorded on the high profile label Nonesuch Records. Not only did concerts include cutting-edge music, but the orchestra also pioneered programming frameworks that moved beyond numerous conventions of orchestral concert programs. Concerts often departed from the overture-concerto-symphony format, sometimes including 5-6 works. Programs often included new music, as well as early music, non-Western music, and rock alongside canonical classical works, often in combinations revealing unexpected resonances—as in a 1966 concert juxtaposing two movements of a Mahler symphony with Webern songs and Webern’s orchestrations of Schubert songs. Other concerts consisted entirely of new music, such as a 1965 concert featured works by Varèse, Boulez, Penderecki, Kilar, and Kagel (then Slee Professor at the University at Buffalo (UB)), and a 1970 event featuring the Grateful Dead together with orchestral works by Foss (with laser show), Cage, and (a rock-ified version of) Bach. Concerts frequently featured leading new music performers as guest soloists and ensembles; the Creative Associates of UB’s Center for Creative and Performing Arts, where Foss taught, were regular guests. Michael Tilson Thomas, now renowned for his ambitious new music projects as music director of the San Francisco Symphony, took over as music director in 1971. He continued many of Foss’s programming priorities, while strongly emphasizing the performance of works by American experimental composers (who would later be the center of his acclaimed “American Mavericks” series). The emphasis upon American experimentalists coincided conveniently with Morton Feldman’s arrival at UB in 1972, leading the BPO to premiere two of his works, The Viola in My Life IV (itself on a remarkable marathon program that also contained Berio’s Epifanie, Cage’s Variations IV, a Charpentier Mass, and Debussy’s Rhapsody) and Voices and Instruments II. Tilson-Thomas also welcomed works that explored the absurd, the theatrical, and blurred distinctions between performance and audience, as in a 1972 program that featured Berio’s Recital I (for Cathy) and David Bedford’s controversial With 100 Kazoos for Ensemble and Audience. Continuing the close relationship between the BPO and UB cultivated by Lukas Foss, the BPO has been regularly featured at June in Buffalo. In recent years, June in Buffalo has provided an important outlet for the orchestra’s new music programming, as detailed in a past post from this publication. A further link between the orchestra and UB is David Felder, UB Distinguished Professor and June in Buffalo Director, who was the BPO’s Meet the Composer Composer-in-Residence from 1992-96. In addition to the new work to be premiered on this year’s festival, he is currently at work on a new work for the orchestra to be premiered in 2018. Due to unforeseen contingencies, Josh Levine will be replacing Brian Ferneyhough as faculty composer at this year’s festival. The Ferneyhough works scheduled for performance will still be presented, while two of Levine’s works will be added to the Wednesday evening concert. This publication previously wrote a profile on Levine, who was a faculty composer at last year’s festival. Wednesday night’s concert will open as scheduled with the MIVOS Quartet playing works by Mumford, Buene, Hellstenius, and Ferneyhough; as a last minute addition, the Slee Sinfonietta Soloists will perform two solo works by Josh Levine. UB graduate student and Dean’s Fellow Jade Conlee will perform Praeludium (Inflorescence II) (2008-9) for piano while UB alumnus and UCSD doctoral student TJ Borden will perform Sixty Cycles (2015) for cello. is the first of two pieces in this series whose point of departure is a return to earlier work of mine, the other being Breathing ritual (Inflorescence V). Though decidedly figurative at first, the piece erupts into a dense superimposition of reiterating lines that forms a vast thicket of notes through which the interpreter must forge an individual path. The composer has made the score available online here. Sixty Cycles was commissioned by the Isabelle Zogheb Foundation for Kevin McFarland, formerly cellist of the JACK Quartet. TJ Borden gave the first complete performance of the piece this past January. Originally planned for a friend’s sixtieth birthday, the work “was born of my thinking about life’s phases and the frequent disjuncture between experienced time and the temporal grids we use to organize our lives (years, months, days…).” The piece consists of 60 phrases of equal (notated) length, each being “ten beats long (the fixed temporal grid), but they vary in perceived and often clock duration through tempo fluctuations and according to the activity and density of the materials that ‘inhabit’ them.” For more detail, have a look at the score, available here. The cello part requires extremely subtle control and virtuosity. The performer explores and struggles with the instrument as if trying to make sense of its capacities, seeking ­– or perhaps trying to regain? – the ability to play with conventional beauty, and uncovering other beauties in the process. In the first half of the piece, for example, a substantial amount of the material is fingered not only in the instrument’s highest, less-exploited reaches, but also often on the “wrong” side of the bow. Similar extensions of traditional sound production arise through instability/variability in the way the bow contacts the string, widespread use of left-hand pizzicato, and the significant presence of high harmonics and multiphonics, sound objects akin to woodwind multiphonics that consist of simultaneously produced harmonics on a single string. Soloists Conlee and Borden are well known to June in Buffalo audiences. Both have played regularly with the Slee Sinfonietta, but are best known for their astounding performances of superlatively difficult modernist solo works. Last year’s festival opened with Conlee’s performance of Boulez’s First Sonata, while the 2015 festival featured Borden’s performance of Brian Ferneyhough’s Time and Motion Study II. For the next installment in our profiles of this year’s June in Buffalo composition faculty, we introduce the work of David Dzubay. Dzubay’s Nine Fragments will be performed by Dal Niente, Kukulkan III by Signal, and Siren Song by the Buffalo Philharmonic Orchestra. This is not Dzubay’s first contact with UB and its network: he attended June in Buffalo as a student in 1997 (during this festival, he also functioned as guest conductor), and one of his principal composition teachers was Lukas Foss, professor of composition at UB during the 1960s. Dzubay’s music has received a formidable amount of institutional recognition across the world. His works have been performed by the symphony orchestras of Aspen, Atlanta, Baltimore, Cincinnati, Detroit, Louisville, Memphis, Minnesota, St. Louis and Vancouver; the American Composers Orchestra, National Symphonies of Ireland and Mexico, New World Symphony, and conductors including James DePreist, Eiji Oue, JoAnn Falletta, Keith Lockhart and David Zinman. He has recently received numerous prestigious honors, including a Sackler Prize, two Fromm Commissions, and an Arts and Letters Award from the American Academy of Arts and Letters; Guggenheim, Bogliasco, MacDowell, Yaddo, Copland House and Djerassi fellowships; awards from the NEA (twice), BMI (twice), ASCAP (thrice), Meet the Composer, the American Music Center, and the Tanglewood Music Center. Currently Professor of Music at Indiana University Jacobs School of Music and composer in residence at the Brevard Music Center, he previously taught at the University of North Texas. Also active as a conductor, he is Director of the New Music Ensemble at Indiana University, and has conducted at the Tanglewood, Aspen, and June in Buffalo Festivals. Dzubay’s music has been praised for its fresh, distinctive voice, which he has cultivated within listening parameters familiar to classical music audiences, those of 19th century Western art music. It is no easy task to find new musical possibilities within this extremely well-worn musical space; below, I explore three strategies the composer uses to “make it new” while not departing radically from certain conventions. John von Rhein, music critic of the Chicago Tribute, writes that Dzubay’s work is “beautifully conceived for the instruments, the music bears a distinctive stamp,” while Michael Anthony of the Minneapolis Star Tribune writes that “he also knows how to translate his imaginings into bright, unusual orchestral sound.” The opening of Siren Song exemplifies some of Dzubay’s orchestrational strategies in action: emphasis on dull or bright instrumental tessituras, ambiguities between harmony and timbre, and between pitched and unpitched instruments, and a stratified polyphonic depth of field, all indicating awareness of innovative 20th century orchestral works. If the music’s kaleidoscope of vivid colors opens up possibilities within a compositional practice centering familiar listening parameters like dramaturgy and harmony, its stylistic and historical diversity serves a similar purpose. Dzubay composed certain pieces as parodies (“in the respectful sense,” writes the composer) of works by Josquin des Prez and Perotin—a framework that thematizes unbridgeable historical difference, cultivating resistance to composing and listening habits. More broadly, as Matthew Guerrerri of the Boston Globe writes, Dzubay’s music frequently draws on a wide stylistic palette, “[gathering] miscellaneous styles under a buzzing, rustling, shimmering sonic umbrella.” The range of reference is wide: Nine Fragments, to be performed at June in Buffalo, was inspired by the music and playing of composer/oboist Heinz Holliger, one of the most radical musicians of the late 1960s and eary 1970s, while other works, as discussed above, take medieval music as their point of departure. Parallel to invoking other music, Dzubay’s works are frequently programmatic, invoking extra-musical phenomena through titles, program notes, and use of referential topoi. These references function to particularize and comment upon received musical conventions. For instance, at 5:19 in Siren Song, the regular drum strokes refer to the genre of the march, perhaps a funeral march. However, certain details—such as the anguished, restless lyricism of the upper-voice melody, as well as the texture’s increasing metric disintegration—contradict the genre’s ramified conventions. The piece’s use of the march defamiliarizes the genre’s conventions; while the genre’s presence in the work lends it dimensionality, engaging in conversation with a familiar, multi-faceted cultural object. This year June in Buffalo is delighted to welcome Brian Ferneyhough back to its composition faculty. Ferneyhough is one of the most celebrated composers of his generation, with performances at most major European new music festivals by most major European new music ensembles, a publishing deal with Edition Peters (who sign few living composers), and numerous recordings (at least 29 currently in print) devoted to his music. His Collected Writings, published in 1995, is widely read, and his influence on multiple generations of younger composers (a not unreliable predictor of future reception) is enormous. His pedagogy is also highly regarded: he is currently Professor at Stanford University, having taught previously at the University of California San Diego, the University of Chicago, and the Freiburg Musikhochschule. He is also a frequently invited guest teacher at music festivals around the world, most notably at the Voix Nouvelles Course at the Abbaye de Rouyamont near Paris; he returns to June in Buffalo after previous engagements in 2013 and 2015. At this year’s festival, Ferneyhough will give a lecture and masterclasses, while guest ensembles and soloists will perform five of his pieces drawn from different periods of his output. 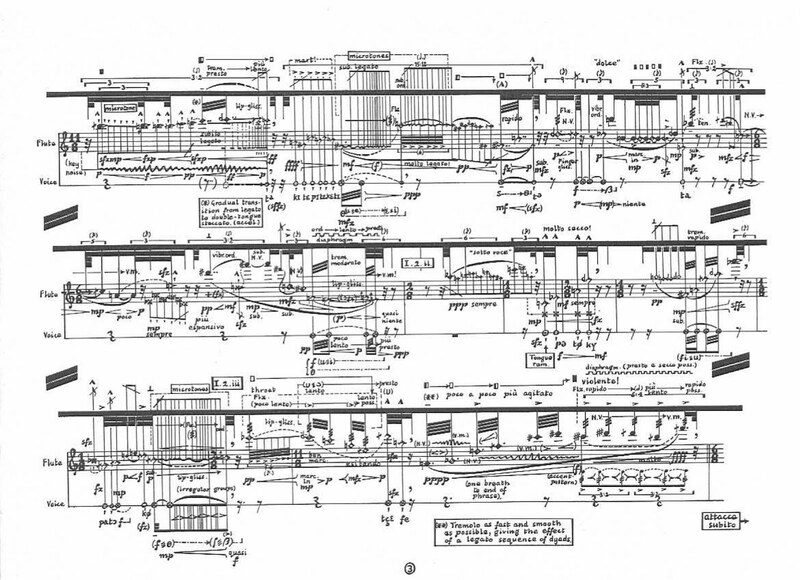 Before discussing specific pieces, it is worth taking time to unpack Ferneyhough’s project as a whole. While he is among the most lauded composers today, he is also one of the most widely misunderstood. The term “complexity”—whether meant as a criticism or not—is not exactly conducive to a wholistic understanding of his music. The significance of his music lies not in its quantitative complexity alone, but in how its increase in quantitative notational complexity induces a more consequential qualitative shift in the nature of the score, performance practice, and interpretation. Therefore, to understand his work primarily in terms of a quantitative deviation from a presumed notational norm overemphasizes its surface features while obscuring their unique, innovative raison d’ȇtre. The material of Ferneyhough’s music is kinetic energy: melodic mobility, and instrumental physicality, as well as intersections between the two. His approach to notation does not per se specify an ideal sound image, but codifies a field of colliding energies--an obstacle course of sorts--for the performer to navigate. The notation aims to create a white-hot but specific energy in live performance, bringing the liveness of music making to the fore. Ferneyhough’s scores employ a range of strategies in their quest for a variegated, animated energy in live performance; here I will discuss three strategies: turbulence, torque, and pressurization. Turbulence means deliberate undercutting of stable reference points through the use of fine, rapidly changing differentiations of pitch, dynamics, articulation, physical parameters (i.e. bow position), and above all rhythmic density (whose shift at each barline undercuts the orientation afforded by a stable pulse). Torque refers to intentional collisions between notational parameters: phraseological emphasis operates against metric emphasis, meaning that the performer must swim upstream against the inherent tendency to emphasize downbeats; concurrently, dynamics, accentuation, and register often operate semi-autonomously, creating resistance to received linear phrasing conventions. Finally, pressurization involves extreme performative and notational registers--high, continuous rhythmic density, together with a saturated notational image--which raise the temperature in live performance. If turbulence and torque fracture kinetic energy in different ways, pressurization intensifies its impact. Therefore, for all its intricacy, the notation conveys and elicits a fundamental physicality. For performers, the path towards unlocking this music’s restless kinetic energy lies in learning the music from two incompatible perspectives: on one hand, attending to the accuracy of individual details, and, on the other, focusing on kinetic energy, on wholistic volitions of gestures and phrases (as the composer describes in more detail in the preface to his solo piano work Lemma-Icon-Epigram). Learning a Ferneyhough piece means finding a personal way to mediate between these competing perspectives. As such, interpretation is not a process of applying conventions for phrasing on the basis of melodic/harmonic analysis (as in pre-1800 Western art music), but rather one of working out a personal solution to the notation’s overdetermined dilemmas from the ground up. Performer and score enter into a non-hierarchical, non-identical relationship: the score renders audible the performer’s individual proclivities, while, in a successful performance, the performer must render audible the broader energetic tensions at the heart of the work. In an era when the overproduction, overconsumption, and museumification of Western art music tightens the grip of habit on performers, encouraging ever more literal, conventionalized interpretations, Ferneyhough’s approach to notation and performance practice offers a unique and ingenious way to place the spontaneity, unpredictability, and vulnerability of live performance at the center of the concert music experience. The two contrasting interpretations of Unity Capsule posted above give some idea as to what this entails in practice. These concerns are perhaps realized most “purely” in two solo works from the mid-1970s, Time and Motion Study II (1973-76) for cello and live electronics, and Unity Capsule for solo flute. The works programmed at this year’s June in Buffalo date from both before and after this period. Coloratura for oboe and piano (1966), to be performed by Dal Niente, marks an early attempt to translate the pointillistic style of the 1950s Darmstadt composers into a musical language concerned primarily with kinetic energy. The Second String Quartet (1980), to be performed by the MIVOS Quartet, marks a break from the solo works of the 1970s. Unlike the solo works, the quartet enters into a more overt dialogue with historical Western art music. Here fractured linear momentum, density, and physicality become a way to defamiliarize clichés of Romantic and expressionistic string writing. The iconic significations of these clichés become liquidated in the music’s multidimensional fractured continuity; their pathos evaporates as heightened physicality gives them a new life. By the 1990s, Ferneyhough had expanded his approach to historical musical materials: “subjective” Romantic gestures are not only recontextualized, but are also placed in conversation with contrasting “objective” materials. Terrain (1992), to be performed by Irvine Arditti and Signal, epitomizes this approach, above all in its instrumentation, counterposing (historically) “subjective” violin soloist with “objective” wind/brass/double-bass octet (the same ensemble as Edgard Varèse’s Octandre). While Terrain activates a collision between Romantic materials and modernist materials, both ostensibly invented from scratch, later pieces have explored what happens when expressionist gestures enter into dialogue with materials from Renaissance music. That is, expressionist materials, predicated upon authenticity of subjective expression, comes into contact with Renaissance materials that predate notions of subjectivity in music (which might be traced to mid-16th century madrigals). Unsichtbare Farben (1999), to be performed by Irvine Arditti, is built from passages of Ockeghem masses that are ultimately inaudible to the listener; here the historical dialectic functions perhaps more as a compositional process towards a result that might not be achieved in other ways, rather than as concrete feature of the listening experience. In In Nomine (2001), however, materials from an eponymous piece by Christopher Tye are more apparent to the listener; Ferneyhough writes that the piece presents found materials “in various distorted forms," exploring a continuum of materials from intact Tye materials at the opening to materials that bear no audible relationship to Tye's style.